Sometimes, all you want during a long day of driving is a quick pit stop—something just off the highway, serving good, basic food for reasonable prices. 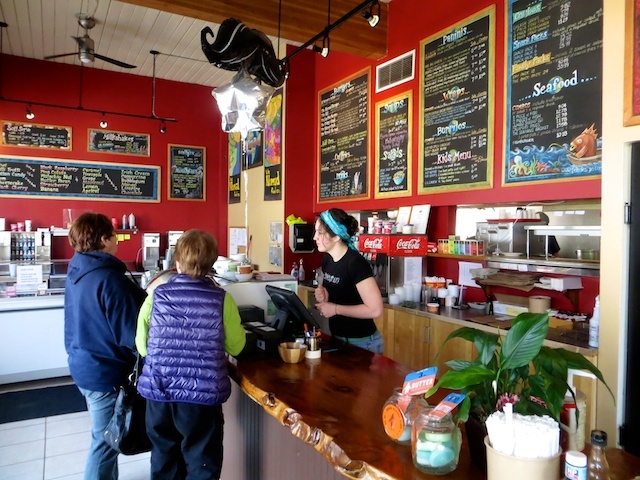 The Nomad Food Company, a bright, cheerful Revelstoke, B.C. restaurant near the Trans-Canada Highway, certainly fills the bill, and then some. 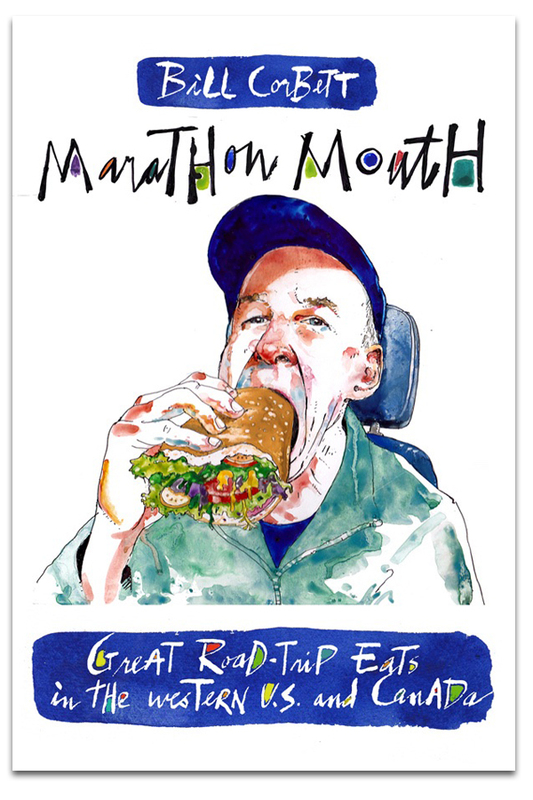 Its counter-service lunch menu covers the classics: burgers, paninis, wraps, burritos, fish and chips and fried chicken. My Junction Burger ($7.29 on its own) is nicely done, featuring a juicy, five-ounce patty with the usual fixings and a slightly spicy chili sauce. I go for the combo ($10.75), eschewing house-cut fries for a great, mounded bowl of chunky beet salad with feta cheese. New owner Deanna and her partner have added specials to the menu and are hoping to have desserts, too, once her pastry chef sister arrives on the scene. 1601 Victoria Road, Revelstoke, B.C. Of course, I can’t resist heading up the road to La Baguette, my favourite bakery/cafe in western North America. 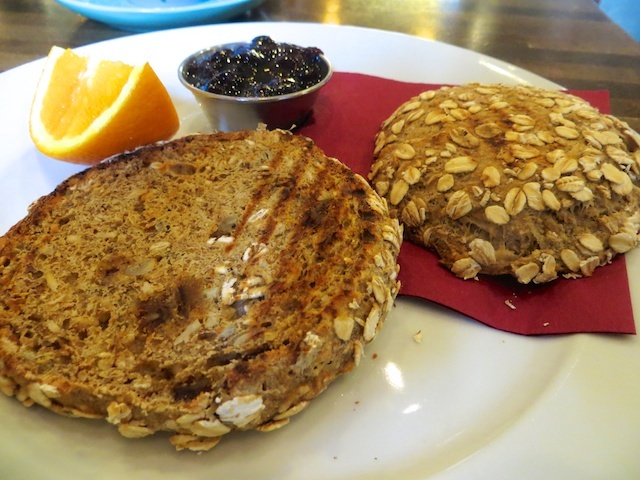 Something as seemingly simple as their toasted healthy bread—a divine concoction of kamut flour, sunflower seeds, flax, dates and coconut, smeared with three-berry jam, all for $3.30—is so sinfully good, it can’t possibly be good for you, can it? 607 Victoria Road, Unit 103, Revelstoke, B.C. This entry was posted in British Columbia, Revelstoke and tagged revelstoke b.c. on March 24, 2014 by bcorbett907. We actually pulled into the parking lot of Nomad a couple of months ago, debated whether it would be fast enough as we were in a rush, and decided to try it another time. Is it fast? It would be great to have another “fast” food choice in Revelstoke as we drive through there quite often. Yeah, my burger was ready in less than five minutes a little before noon on a weekday. I always try to avoid peak times at any restaurant I visit. Now I feel sad that I settled for a Tim Horton’s bagel. We will definitely stop there next time through. Thanks for the recommendation. Mmmmmm Nomad! 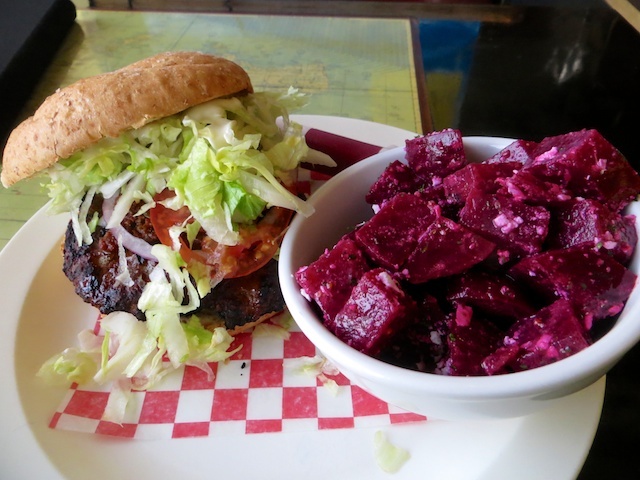 Best burger joint in Revy… Mmm tandoori chicken panini with the house homemade coleslaw! My wife and I just stopped at Nomads last Saturday evening. Service was quick, food was great and the prices very reasonable. Well worth a stop, we’ll be back I’m sure.